Was that a thing in your house when you were growing up? Alliteration-based menus? It wasn’t in my house. My mother, who thank goodness was, and still is, a very good cook, had a library of tried and true recipes that she rotated through on a pretty regular basis, most of which I ate happily, some of which I did not (I‘m looking at you, Stuffed Bell Peppers). Tacos, I’m sad to say, wouldn’t start making an appearance in the rotation until I was a ‘tween, or as we called it back then, 10 years old. When it was taco night, my mother, armed only with a pound of ground beef and a packet of the World’s Saltiest Taco Seasoning, would have us stuffing taco shells (Ever notice how they always seem to taste stale, even when freshly opened? Why is this?) within mere minutes. It was a serve-yourself kind of situation, the table packed with bowls or saucy, salty beef, bright orange shredded cheese and all of the other standard Americanized taco toppings. Back then, there was no shame in that game. This was a family friendly meal – it was cheap, it had the beef my dad demanded preferred, it was easy for my mom to make and what kid doesn’t like tacos?? Now that I’m all grown up, fortunately my tastes, and my taste buds, have changed. These days, these shrimp tacos are my idea of a perfect family meal. They are super quick to make, have a perfect gentle kick of spice, don’t make you swell up like a freaking toad from all the sodium, they’re healthy (shh! don’t tell the kids!) and you can put out all the fixings in little bowls and let the kiddos make ‘em how they want ‘em. Kiddos love that. So let’s bring back the alliteration dinners. As a matter of fact, I’m so committed to doing it, I think I’ll knockout 2 in one day, namely Margarita Monday and Taco Tuesday. Hopefully that won’t lead to the terrible combination of Water Wednesday and Tylenol Thursday. Heat oven to 200° or Warm. Heat a cast iron or other heavy skillet over medium-high heat. Warm tortillas and wrap in foil. Place in the oven to keep warm. Heat the oil in the skillet over medium heat. Add the corn and cook until golden brown and slightly tender, about 10-15 minutes. Season with salt and pepper, remove from the skillet and place in a bowl. Cover with foil and set aside. Combine blackening ingredients in a large zip-top plastic bag. Add the shrimp to the bag, seal and shake well to coat. Remove shrimp. Add the shrimp to the skillet and cook until done, about cook 2 minutes per side. Because we’re blackening them, we don’t need to add any additional oil. Combine sour cream and lime juice in a small bowl, season lightly with salt to taste. Place 2 tortillas on each of 4 plates. 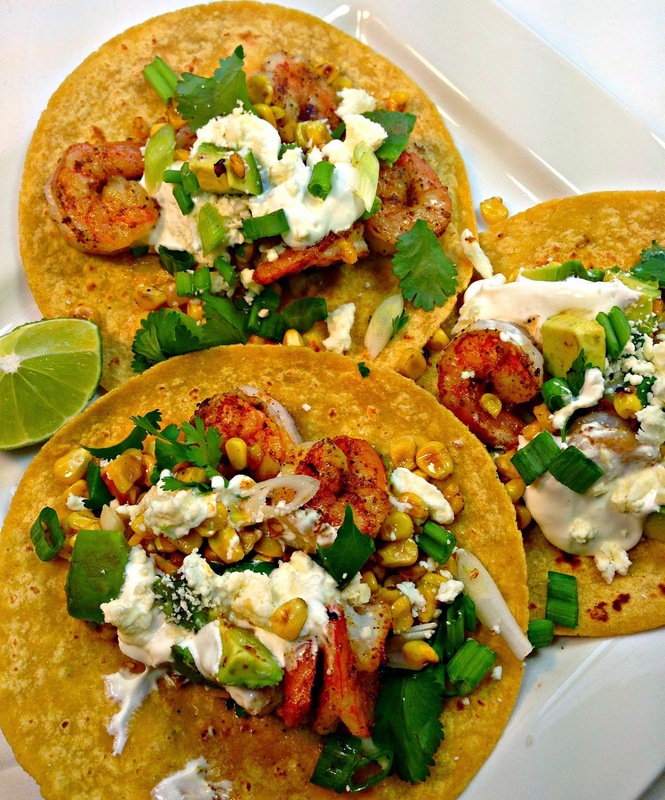 Starting with the corn, divide the corn, shrimp and avocado evenly among the tortillas and top with the cheese, green onions, cilantro, and a dollop of the lime cream sauce. These look incredible!! Love how healthy they are but also so full of flavor! Wow so much flavor! I would definitely love to have this soon for lunch! 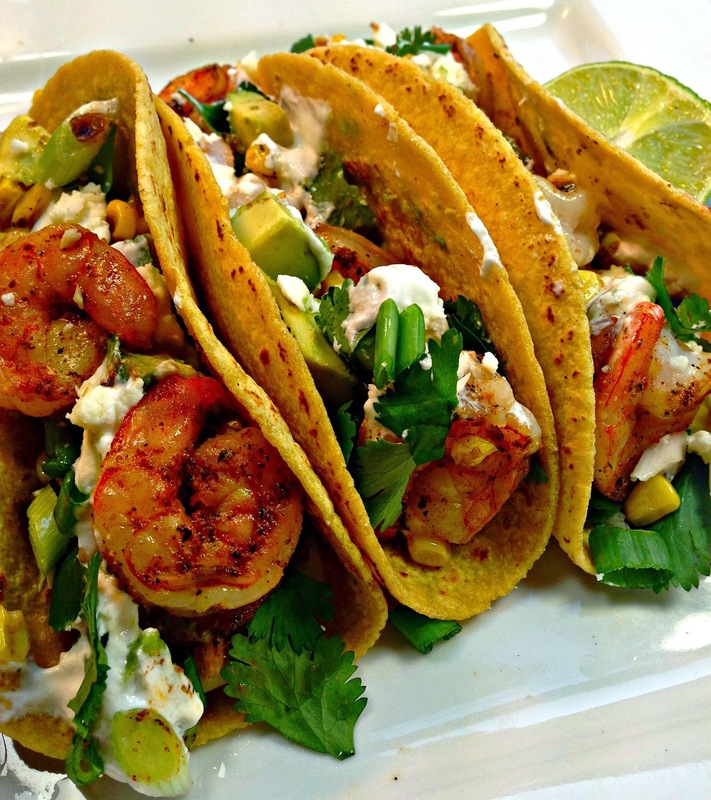 I love shrimp tacos, and adding blackening seasonings sounds extra good!